Our meal tray system combines a flexible selection of multi-compartment trays with a range of easy to use sealing machines. There are three basic machine sizes, depending on the size of your operation. All our machines use heat sealing technology to ensure a secure seal around each individual tray compartment. This means a safe, leak proof film lid can be securely fixed as soon as the tray is filled. The film, which can be printed with your logo or heating instructions*, adheres to the rim of the tray as well as to the edges of each compartment to prevent spillage of one part of the meal into the other during transit. This leads to more attractive, tasty, nutritious meals than may otherwise be possible in other trays and, despite the secure seal, the film lid can be immediately removed prior to consumption. 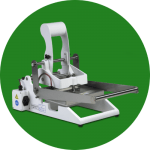 The 1208 is a sealing machine ideally suited to the smaller sized catering operation. The machine is manually operated and is capable of sealing up to 4 trays per minute. 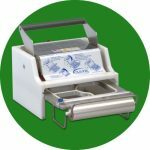 The 1308 is our MOST POPULAR machine and is ideally suited to small / medium sized catering operations. 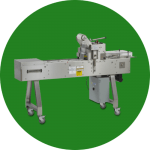 The machine is hand operated and is capable of sealing 6-10 trays per minute. The 1808 is a semi-automated machine ideally suited to medium/larger catering operations. This machine is capable of sealing up to 32 trays per minute. 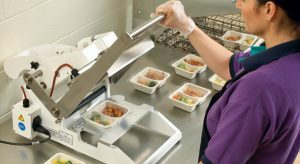 Community meal providers switching to our meal trays may qualify for FREE provision of our sealing machines and training. Please contact us if you are a community meals provider and feel you may be entitled to this offer.